I seat myself with pleasure to write you a few lines to let you know how I am and how I am getting along. My health is pretty good at the present time. There [are] quite a number of the boys in our Company that are sick just now. Frank Arbuckle and Tom Marshall have got the Small Pox. The rest of the boys that are sick have got the Chills. Five Companies of our Regiment, including ours, are camped on the bank of White River about 2 miles below town. 2 Companies have gone to the mouth of White River. 2 Companies are in camp close to town and the other Company has gone into the country to guard the hay makers. Our detachment have to take care of horses and some guard duty. I do guard duty. I am on duty about every third or fourth day. Mrs. Rose can tell you all the news better than I can write. I want to know if you have ever heard anything from Ellen yet. I feel quite anxious to know if she has come to the Rock yet. Just as soon as she does come, I want you to let me know. I would like to have you send me some money if you have got any that you can possibly spare if it is not more than one dollar. We have not been paid yet. When we are, I will make it good to you. I need some for spending money and am now entirely out. Send me some if you possibly can. Tell sister Ellen that I am well and hope she is the same. Give her my best respects and I like to have her write to me. I will answer it just as soon as I get it. I don’t think of anything more to write just now. Write to me soon, dear Aunt, and let me know just as soon as you hear from Ellen (my wife). Give my best respects to all the friends and accept my best wishes for yourself and Sister Ellen. Corporal Henry Williams by D.X.S. 113th U.S. Colored Infantry (New)–Organized April 1, 1864, by consolidation of 11th United States Colored Troops (Old), 112th United States Colored Troops and 113th United States Colored Troops (Old). Attached to 2nd Brigade, 1st Division, 7th Corps, Dept. of Arkansas, to August, 1865, and Dept. of Arkansas to April, 1866. Duty in Dept. of Arkansas. Mustered out April 9, 1866. The roster of the 11th U.S. 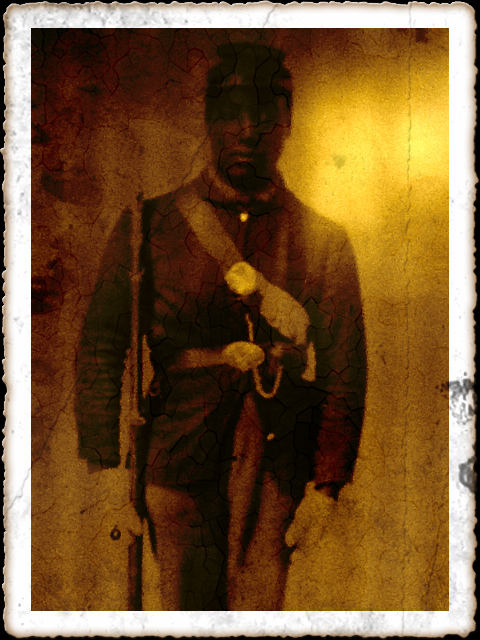 Colored Infantry (Old) indicates that two soldiers by the name of Henry Williams joined the Regiment. One of them may be the one buried in Little Rock who was a Private in Company G, 113th U.S.C. His grave marker can be seen here. The other Henry Williams may be Cpl. Williams of Company D. If so, his service would have begun with the 11th U.S. Colored Infantry (Old), which was organized at Fort Smith, Arkansas December 19, 1863 to March 3, 1864. Attached to 2nd Brigade, District of the Frontier, 7th Corps, Dept. of Arkansas, to January, 1865. Colored Brigade, 7th Corps, to February, 1865. 2nd Brigade, 1st Division, 7th Corps, to April, 1865. SERVICE–Post and garrison duty at Fort Smith, Ark., until November, 1864. Action at Fort Smith August 24. Moved to Little Rock, Ark., November, 1864. Action at Boggs’ Mill January 24, 1865. Duty at Little Rock and at Lewisburg, Ark., until April, 1865. Consolidated with 112th and 113th to form new 113th U.S. Colored Troop April 22, 1865. More information on the history of the 11th US Colored Infantry (Old) can be found here. Names of the soldiers that enlisted in the 11th can be foundhere. Several headstones of soldiers that served in the 11th have been located and documented here. The Frank Arbuckle mentioned in Henry’s letter may be the Black farmer of Pulaski County listed in the 1870 and 1880 Census Records who was born about 1842 in Tennessee and whose wife Caroline was born about 1836 in Virginia. The Thomas Marshall mentioned in Henry’s letter may be the Black farmer of Pulaski County (Ashley Township) listed in the 1870 Census Records who was born about 1835 in Tennessee and whose wife Jane was born about 1844 in Alabama.